It’s the muscle behind the swagger. With 266 horsepower on tap, Sienna certainly isn’t short on thrills. Refined and powerful, this 3.5-liter V6 engine helps Sienna move at the speed of your family. And since it offers an EPA-estimated 25 highway mpg, fuel stops won’t get in the way of your fun. Sienna takes cul-de-sac cred to the next level. With its aggressive front grille, bold headlights and taillights, and sports sedan-inspired styling, Sienna is just as fun for kids as it is for adults. So whether it’s for a parents’ night out or an early-morning practice, you can roll up in style. Sienna’s packing possibilities are limited only by your imagination. Depending on how the seats are configured, you can adjust cargo volume from a generous 39 cubic feet behind the third row to a whopping 150 cubic feet with the second and third rows folded. 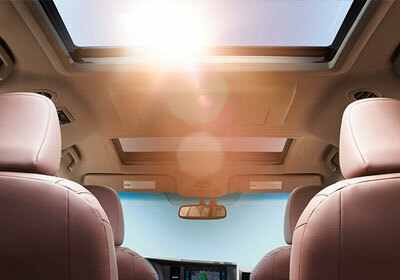 The sporty Sienna SE features projector-beam headlights with smoked lenses and LED taillights for a sleek, modern look. 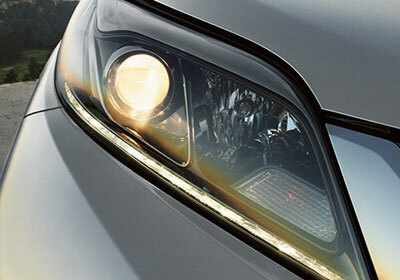 The LED Daytime Running Lights (DRL) add even more swagger. These shine bright, and with their eye-catching profile, add a premium feel. Everyone is a VIP inside Sienna, especially the person driving. A wraparound dashboard design moves all controls closer to the driver, so it’s easier to keep you comfortable and entertained. 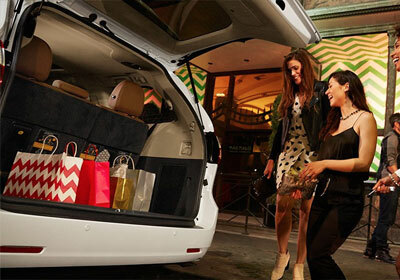 Whether you’re head of the carpool or head of the family, you'll have room for everyone in Sienna. On 8-passenger models, the versatile center seat in the second row folds upright to form an additional seat. Now everyone, and their friends, can come along. When you’re running errands, your hands are often full. So Sienna is available with our Smart Key System, a convenient keyless access system. As long as the Smart Key fob is in your pocket or purse, you can open Sienna’s doors with the touch of a handle, and start or stop the engine with the push of a button. Sienna lets you make hands-free phone calls and stream music from your compatible phone or portable device using Bluetooth® wireless technology. Using Bluetooth®’s advanced voice recognition, you can just tell the system what you want it to do. Sienna provides a standard integrated backup camera. A backup camera with panoramic view is available on Limited to help make reversing and parking easier. You can choose from wide or normal views, plus three guideline modes that show your distance, projected path and more. Sienna has the most standard airbags in its class. An Advanced Airbag System helps protect you and your family with driver and front passenger dual stage airbags, driver and front passenger seat-mounted side airbags, a driver knee airbag, a front passenger seat-cushion airbag, and Roll-sensing Side Curtain Airbags (RSCA) for all rows. Four LATCH (Lower Anchors and Tethers for CHildren) locations help provide an added measure of safety for the smaller members of your family. LATCH includes lower anchors and tethers on outboard second- and third-row seats. Proper inflation pressure is not only important to overall vehicle handling, but to safety as well. Sienna’s standard Tire Pressure Monitor System (TPMS) will illuminate an icon on the instrument panel if tire pressure gets critically low.